Written and Directed by Aaron Sorkin. Starring Jessica Chastain, Idris Elba, Kevin Costner, Michael Cera, Bill Camp, Brian d’Arcy James, Chris O’Dowd, J.C. MacKenzie, Jeremy Strong, Samantha Isler, Jon Bass, Justin Kirk, and Graham Greene. 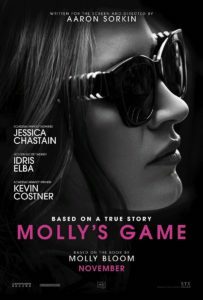 Molly’s Game opens with a flashback to titular Molly Bloom’s (two-time Academy Award nominee Jessica Chastain) Olympic skiing days, noting over the narration that the unbelievable circumstances leading to her dispiriting failure has nothing to do with poker, and by extension, the rest of the story. Truthfully, that couldn’t be farther from the truth (it’s something Molly actually comes to realize in the ending, but I’m getting ahead of myself), as the unfortunate winter event seeing her highly impress before crashing and burning all within 30 seconds mirrors the highs and sunken lows of Molly’s voyage into hosting high stakes poker games (players include but are not limited to Hollywood stars, rock musicians, wealthy hedge fund owners, hotshot businessmen, and eventually the unbeknownst presence of the Russian mafia), representing lucrative financial gains and later finding herself addicted to drugs and facing lengthy incarceration time after being tipped off to the FBI. The feature also marks the directorial debut of outstanding television and film writer Aaron Sorkin (The Social Network, The West Wing) who, adapting Molly’s own true accounts from her book, imbues the tone with his mastered craft of rapid-fire dialogue where every sentence feels pertinent to the overall story or a specific character (it doesn’t matter if it’s done through the Scorsese-reminiscent amounts of narration likening Molly’s Game to Casino). It may be his first time in the director’s chair, but Sorkin knows the key to success lies in his writing and abilities to really get inside the head of Molly and exploit her shallow and materialistic indulgences in a way that doesn’t feel true to her personality. Molly definitely toes the line between greedy (there are times she crosses that line) and being morally conscious of how her actions directly affect the lives of others. Quite a few of the poker players are sympathetic in their addictions, which is another testament to the writing prowess of Sorkin; many of them carry distinct traits such as the loving husband who develops chronic behavior of throwing money away, a heavy drinker who seeks comfort in Molly while starting every conversation with what she describes as “the sound of a hard-boiled detective novel title”, and a man likable but clueless to the game. Additionally, there are also utter weasels only interested in Molly bringing naïve, fresh meat to the table for feasting on; Michael Cera’s Player X (an alias that is given to him in voiceover by Molly to protect his real-life likeliness) says it best, “I’m not here to win, I’m here to destroy lives”. Subsequently, this makes occasional sequences of poker exciting to watch, even if you’re unfamiliar with the rules as 1) Molly explains aspects as she learns them herself and 2) it’s not that hard of a concept to understand in the first place. Over time, the players change becoming even more high-profile as does Molly’s lifestyle, quickly going from rooming at a friends house to owning her own suites where she runs the operation. Alongside that, her wardrobe gradually becomes more expensive; Molly tends to wear revealing clothing while hosting the games, which to some may come across as objectification on the part of the filmmakers, but I assure you, it is the furthest reality from that assumption and actually something that beautifully ties into her past psychological issues. The reason the film works in spite of this excessive and off-putting debauchery is an easy one; it’s a facade and not the real Molly Bloom. She’s hiding vulnerabilities. 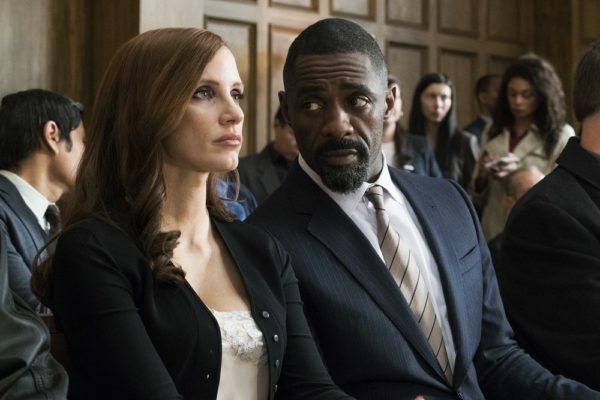 Tightly woven into the rags-to-riches story are scenes depicting Molly awaiting trial and discussing the whirlwind of events with her attorney Charlie (Idris Elba), and it’s in these moments where we can confirm that Molly is not a bad person, just someone that made a few stupid mistakes. For starters, she didn’t even know some of the players toward the backend of writing this gig were mobsters, and although she does have a lapse in judgment committing an illegal act, never does anything unforgivable. In conjunction with the above, Sorkin’s secret weapon is Molly’s strained relationship with her father (Kevin Costner) that proves to function as the reason she does anything and everything, good or bad. Towards the end they share an exchange together (it should be the Oscars clip if Jessica Chastain deservedly receives another nomination) that pushes a 3-star film into 4-star territory, granting new perspectives to who Molly is as a person. Initially, I wasn’t sure about Sorkin directing his own film; he struck me as a brilliant writer with a keen mind for rationalizing characters’ minds who easily could have botched stepping behind the camera for the first time. And although Molly’s Game does contain a few rookie mistakes (the ending is a bit too feel-good and along the way is material that could be trimmed to make a leaner film), it’s a terrific debut. On one final note, it is absolutely acceptable that the movie does not explore Molly’s personal relationships or flings, as even if there were any, it wouldn’t have added anything to the narrative. 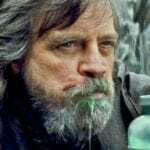 If anything it would have just gotten the story more bloated. Instead, it’s about Molly trying to maintain her good morality as she navigates the addictive scene of low-key high-stakes poker, effectively exploring what drives her into and keeps her in the world.